The Vigor GK80 Backlit Mechanical Keyboard from MSI is a full-sized keyboard designed with the performance that gamers need as well as the aesthetics to match. It's built with Cherry MX Red switches, which have a linear travel and a short actuation distance for a responsive typing experience. Once it's connected, you can download MSI's optional software to set up custom macro and lighting profiles, sync it with other RGB components, as well as overclock your system thanks to its hardware control hotkeys. For durability, it features a lightweight aluminum construction and comes with four metal and twelve double-injection keycaps that you can swap out whenever you want. Mechanical keyboards utilize a different type of key switch technology for a more durable and unique typing experience. The Cherry MX Red switch has an actuation force of 45g and features a linear travel with no tactile bump. This can be beneficial for users who don't need the tactility of other switches. Additionally, with close actuation and release points, Cherry MX Red switches allow for easier double-tapping. Unlike Cherry MX Blue switches, these do not have an audible "click" mechanism, allowing for a quieter operation. Noise generated from this keyboard will be from the key either springing back into place or "bottoming out" – making contact with the back plate after a particularly hard press. By downloading MSI's Gaming Center software, you can configure your own custom macro and lighting profiles for specific games and easily switch between them when needed. With MSI Mystic Light, this keyboard provides you with millions of colors and multiple effects to choose from. You can even download the Mystic Light sync software to coordinate your lighting with other RGB compatible components and peripherals. Activate Gaming Mode by pressing the function and Windows keys for N-key rollover, which ensures your commands are precisely and accurately recognized, regardless of how complicated your multi-key inputs are. 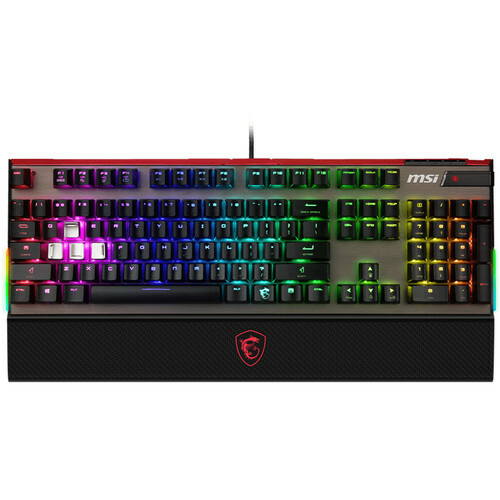 Using the function key and the indicated hotkeys on the keyboard, you can have direct control over your MSI gaming motherboard and graphics card. Switch through three performance modes: OC, Gaming, and Silent whenever you want without having to leave your game. Located at the top right of the keyboard is a USB 2.0 Type-A pass-through port that you can use to connect other peripherals such as a flash drive, mouse, or gaming headset. It also supports up to 500 mAh charging. This keyboard comes with four metal zinc alloy WASD keycaps as well as twelve double-injection rubber keycaps. Use the included keycap removal tool to swap the keys you need. Box Dimensions (LxWxH) 19.1 x 8.0 x 3.6"
Vigor GK80 Backlit Mechanical Keyboard is rated 5.0 out of 5 by 1. Rated 5 out of 5 by Scott from wow, what a keyboard By far this is the best gaming keyboard I have owned! It is constructed extremely well and does not feel cheap at all. It has a very good weight to it and feels very solid. It has an aluminum base to it so there is absolutely no twisting or warping to it. The RGB lighting as just amazing and you can use the mystic light feature to control many aspects of the lighting as well as link it to other MSI products if you have them on your pc. The palm rest is made of metal not plastic so it is extremely rugged as well and you can even store your extra key pads underneath it via a slot they have built in to it. The only small complaint I have, and this is mostly just personal, is when you have the palm rest all the way against the keyboard it puts my left hand, which I use for gaming, in position where it did not feel as supported as I would have liked. Of course the simple solution here is just to move it farther back from the keyboard to accommodate your hand position depending, of course, how much room you have on your desk to move it around. Over all a fantastic keyboard, very happy with this purchase.